MADNI SQUARE is destined to be the chef d'oeuvre of the urban way of life. Here is a space that you can joyously call your Business Place & Home. Here is a place where you can relax and revel in. Here is a home that you can cherish for a lifetime. 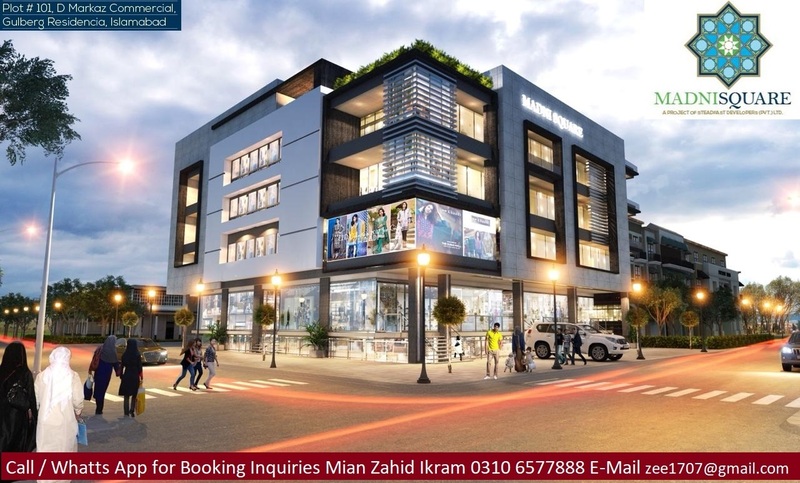 The architects of MADNI SQUARE have capitalized on the beautiful surroundings of Gulberg Resdencia in Islamabad the beautiful and designed the building so that each apartment has a beautiful view that affords stunning views of Gulberg Resdencia. There are various sizes of shops, offices and apartments available for booking. The developer has fixed rates per sqft for each floor, so you can check the prices and avail this opportunity on easy 30 Monthly installments. Bookings start from 25% down payment, while 65% amount is payable in 30 easy Monthly installments and 6 Half Years Installment Plan. Last payment of 10% will be payable at the time of possession.